My name is Alice McInnes, and I’m a sea kayak coach and guide based in Edinburgh, Scotland. I run coaching days and trip in my local waters on Firth of Forth and East Lothian. 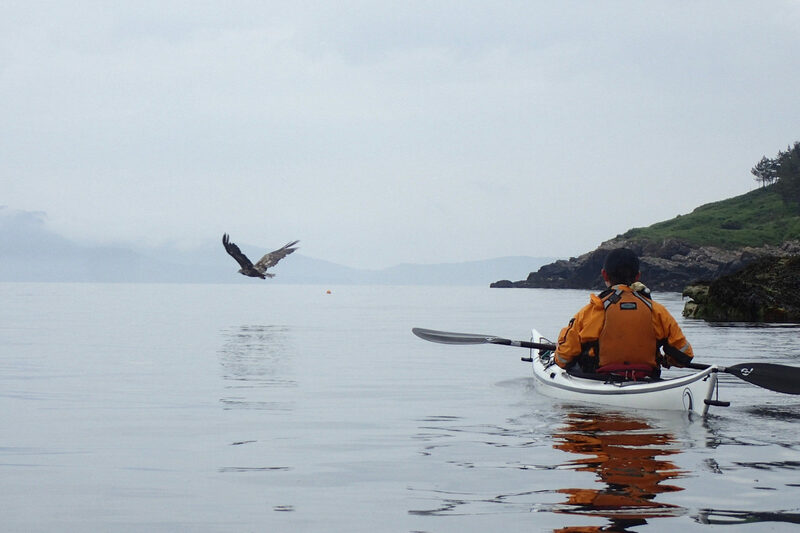 I also run multi day sea kayaks trips on the west coast of Scotland in locations such as the island of Bute, Arran, the Cumbraes, Oban, the Slate Islands (i.e Seil, Easdale Luing), Skye and Shetland. I’m an ambassador for Tiderace Sea Kayaks – and have a range of kayaks to suit all. If you would like to use a Tiderace kayak on one of my trips then let me know. I am a founder of the Women’s Sea Kayak Festival, a UK-based all-female event which helps promote female paddlers and coaches on and off the water. Started in 2012, it is the UK’s only all-female sea kayaking event, and has proven that there is both interest and demand for female-specific events and for female voices on the water. I am passionate about helping more women get out and enjoy time on the water. A spin-off sister festival runs in Devon. North-west Scotland, Summer isles, Handa. Firth of Forth and East Lothian – the islands of the Forth, including Bass Rock, St Abbs. I started sea kayaking in 2009, having spent many years in the mountains walking, climbing and biking. I fell in love with sea kayaking and the sport that gives you 360 degree views, encounters with marine life, weather that can be literally thrown at you, access to the most fantastic beaches in the country, and a friendly international community of fellow paddlers. My aim is to paddle around the entire coastline of Scotland. In 2016 I paddled from Skye to Thurso and in 2017 made it around Dunscansby Head and hope to enjoy every kilometre as I continue my journey. In 2017, I took the option of redundancy from a job in a well-known bank in Edinburgh, and swapped my office chair for a kayak seat and my spreadsheets for a OS map, and I am pursuing my passion for kayaking and the outdoors. I occasionally use a short surf kayak, and paddle down rivers which makes me understand the value of continual learning. I’ve completed a course on coastal Interpretation, understanding weather and climate and tidal habitat. I’m an active member of the Lothian Sea Kayak Club and the online community SSKEG (Scottish Sea Kayaking E-group). Copyright © 2019 Sea Kayak Alice. All Rights Reserved. The Arcade Basic Theme by bavotasan.com.